What do you need for your ideal hideaway? A mountain view and an icy lake? Dense woodland and a log burning hot tub? A warm nook for reading, or a breezy beach veranda for birdspotting? If this is the kind of thing you dream of, this book will make you smile from the beginning to the end. Stuffed with great photos of boltholes all over the world, the combination of escape and nature plus contentment is irresistible. The book is a selection of highlights from the blog http://cabinporn.com/, where it is possible to spend an inordinate amount of time looking at beautiful places and sighing wistfully. This lovely paperback also has short essays with enticing titles such as ‘how to live 30 feet in the air’ and ‘how to make a homestead in the wilderness’. However, I must confess to not actually having read a single one of these most-likely-excellent pieces, as I have fallen into the pictures and can’t get out. I don’t think I have ever reviewed and recommended a book in which I’ve not read any of the words! I prescribe one volume of this topped up with occasional dips into Danish cosiness manual Hygge (which we also have… see https://www.penguin.co.uk/books/1112343/the-book-of-hygge/) for maximum comfort and consolation. Curl up and enjoy. Carl Cattermole’s short, sharp, shockingly good guide to life on the inside is without a doubt one of the best books I’ve read all year. 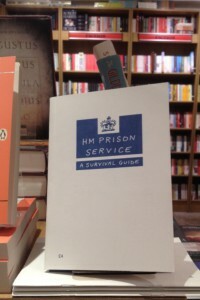 Unlike so many of the squillions of things that get ushered into print each month, H.M. Prison: A Survival Guide is a book that feels like it urgently needed to be written, and equally urgently; needs to be read. It’s the upshot of a truly generous impulse; to demystify the prison experience and to offer pragmatic help to a huge amount of people who are often vulnerable, confused and scared. It should also, of course, be required reading for anyone and everyone on the outside. The ‘Survival Guide is eye-opening, at times eye-watering, and thoroughly educational in every sense. Like all the best books; it works as a kind of empathy generator. It’s also dirt-cheap (£4!). And it’s not-for-profit. And it looks and feels great. What more could you want? This is that rare kind of book that actually helps to make the world a better place.